When you are on a team, you MUST be fully accountable to your teammates and coaches. 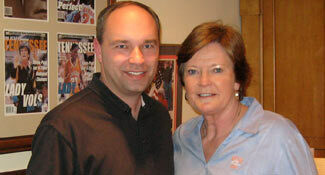 They rely and depend on you to consistently do your job and act in ways that benefit the team, not just yourself. Skipping your summer workouts, forgetting the plays, and taking plays off doesn't just hurt you, IT HURTS EVERYONE ON YOUR TEAM! Because your success and failure are closely intertwined with that of your teammates, as an Accountable Teammate you always must invest the time to consider how your words, behaviors, actions, reactions, energy levels, and even body language might affect your teammates. 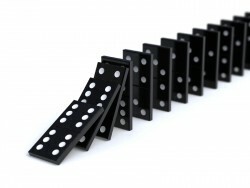 Much like a series of dominoes, your choices create a chain reaction that influences other events. You must get in the consistent habit of thinking before speaking and acting. You must consciously consider how your every action, interaction, and even inaction could impact your team. 1. How could this impact my teammates and/or coaches? 2. How could this impact our team’s chances of success? 3. How could this impact our team’s reputation? Pittsburgh Steelers receiver Antonio Brown secretly posted his coach’s postgame talk live on social media, without the coach knowing or getting his permission. In the talk, Steelers coach Mike Tomlin mentioned some unkind things about their upcoming opponents, the New England Patriots, for the whole world to hear. Of course the Patriots saw the video, which only provided them with some extra motivation to beat the Steelers the following week 36-17 on the way to winning the Super Bowl. Harvard men’s soccer created a written rating system of the physical appearance of the female student-athletes at the school. When the highly inappropriate document was discovered by administrators midway through the year, the rest of their season was cancelled. Tennis player Maria Sharapova took a banned substance and was suspended for two years from playing tennis. She lost millions of dollars in endorsement deals with American Express, Tag Heuer, and Avon. There are obviously numerous others we could list but you get the picture. The point is: Accountable Teammates consciously and carefully consider the consequences BEFORE they act so they can minimize or eliminate the chances of hurting themselves, their team, and others. One of the primary reasons why some coaches hold the whole team accountable for one person’s mistake is that a single person’s choices and actions can have serious consequences that impact everyone on your team. One person’s choices can be the margin between winning and losing. If one athlete turns over the ball, your whole team loses possession. If one person misses a coach’s base-running sign, your whole team is thrown out at home plate. If one person doesn’t guard/mark their person, your whole team gets scored on. If one player commits an unsportsmanlike act in football, the whole team is penalized 15 yards. If one person gets arrested for driving under the influence, your whole team’s reputation suffers. If one athlete cheats on a test, the whole school thinks your team is a bunch of cheaters. If one player lacks focus and attention to detail, your whole team pays the price of losing. you realize there are no little things." The physical, mental, tactical, and personal mistakes and breakdowns of a single person impact your whole team. Your sloppiness, tardiness, and selfishness hurts your teammates and coaches. It makes their life tougher, it doubles their work, it sets them back, it gives them a black eye, it keeps them from winning championships. Everyone on your team is impacted by your actions – just as you are theirs. Your problems multiply and become OUR PROBLEMS. When you quit on yourself, you also quit on your teammates and coaches. When you embarrass yourself, you also embarrass your teammates and coaches. When you let down yourself, you also let down your teammates and coaches. When you push yourself, you also push your teammates and coaches. When you inspire yourself, you also inspire your teammates and coaches. When you lead yourself, you also lead your teammates and coaches. Looking for a Great Read for Your Team? 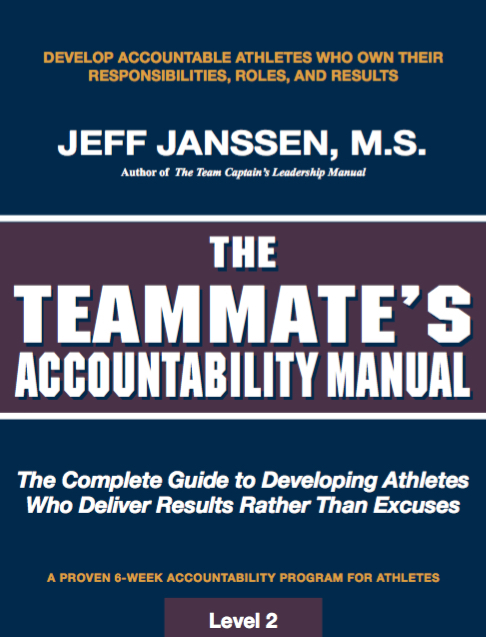 Our Teammate's Accountability Manual is the perfect book for your whole team to read and apply so they are fully accountable to each other.